Traditionally Rasamalai is prepared with homemade paneer (malai) which is then soaked in yummy syrup (ras) and hence the name Rasamalai. I have posted homemade rasagulla this Feb and you can find the recipe here. 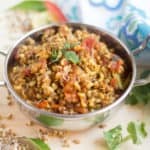 For those who wanted to prepare from scratch, you can prepare the malais as mentioned in that post and use the ras recipe from below. 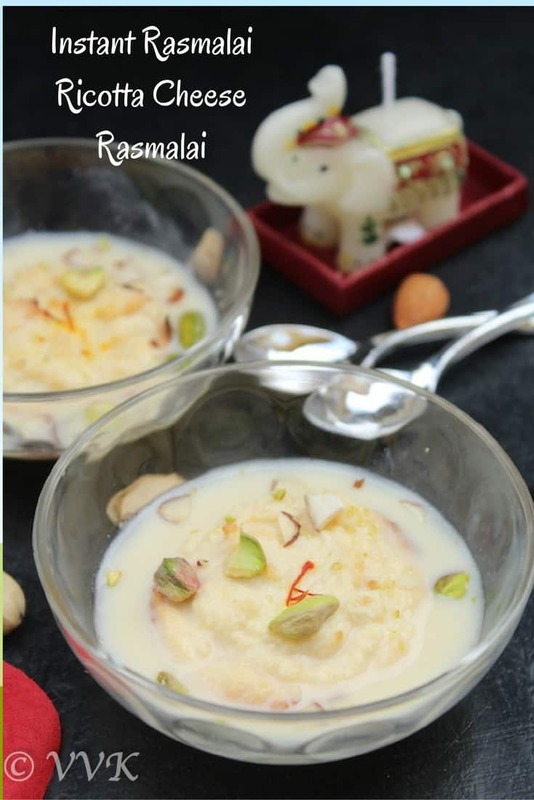 For this instant rasamalai, I used Ricotta cheese and also to speedup the ras preparing process; I used the combo of evaporated milk and regular milk and also condensed milk to enhance the richness. For the baking time, I referred time to Anu’s post. Please see other variations in my notes section. Before getting into the post, let me explain about ricotta cheese. Ricotta literally means recooked. Ricotta is an Italian whey cheese made from milk whey left over from the production of cheese. Taste of home defines it aptly, “when a cheese maker separates milk or cream into curds and whey, the curds are used to make cottage cheese and the whey is used to make ricotta. That’s why both cheeses, although similarly soft and mild in flavor, have such different textures. Both are considered “fresh” cheeses.” Also it’s easy to find rennet free ricotta cheese. (I owe couple of post about cheese, will post it soon). 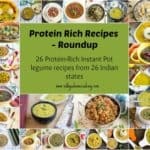 If you looking for vegetarian cheese list, you can find them here. Ok, no more explanations. 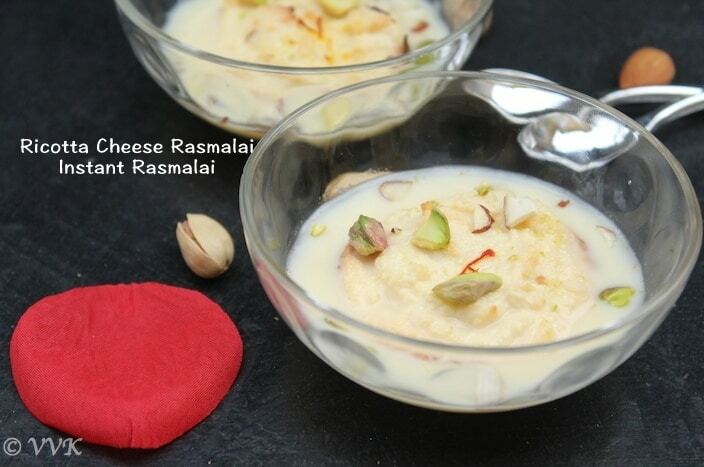 Without any further ado, here comes the Ricotta cheese rasmalai. As I was preparing lot of sweets, I didn’t prepare this in a big batch. So double the measurements for a bigger batch. Mix the Ricotta cheese and 4 tbsps of sugar. Make sure they are incorporated well. 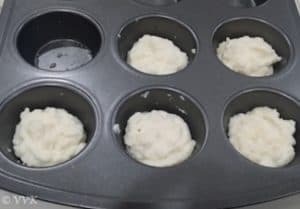 Now grease the muffin tray with oil and scoop out 2 tbsps of the ricotta cheese and sugar mix and pour it in each muffin dip/hole. It will brown up in the sides, but do not panic. It should brown up and when you insert a tooth pick, it should be come out clean. That’s the right consistency. Remove them from the muffin tray and let it cool for 10 minutes. Add the saffron to the 3 tbsps of hot water and let it soak for about 10 minutes. Meanwhile, in a heavy bottom pan, add the regular milk and evaporated milk and let it warm. When the bubbles starts to form, add the saffron soaked water, elaichi powder and sugar. Mix them well and let it simmer in low heat for about 6-7 minutes. Now add the condensed milk and let it further simmer for 3 to 4 minutes. Let this cool down to room temperature. By the time the malai gets baked, the ras will be cooled down too. In wide serve ware, place the baked ricotta cheese malai and slowly add the ras and make sure the malai gets immersed nicely. Cover and refrigerate it for at least 30 minutes before serving. But more it soaks, it tastes better. Take one or two chilled and soaked rasmalais in serving bowl. Add sufficient ras and now garnish it with chopped nuts and saffron. I used pistachios and almonds. Chopped nuts can be added while preparing the ras. I prefer crunchy nuts, so I just add them before serving. I used raw nuts and I didn’t toast them. 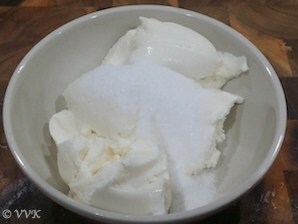 While preparing the malai, adding sugar is optional. Also you can add elaichi powder or rose syrup to the ricotta cheese mix for enhanced flavors. 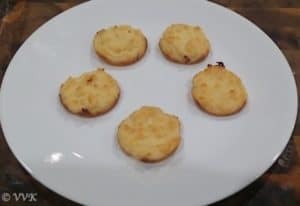 Baking time varies depending upon the cheese quality and also depending upon the rack positions in the over. After 30 minutes you can check the malai and depending on that you can set the additional time. I placed in the middle rack and baked for 40 minutes. 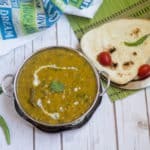 Ensure both the ras and malai are cooled down before assembling them together. Evaporated milk is optional. Instead you can add regular milk and add 1 more tbsp of condensed milk. 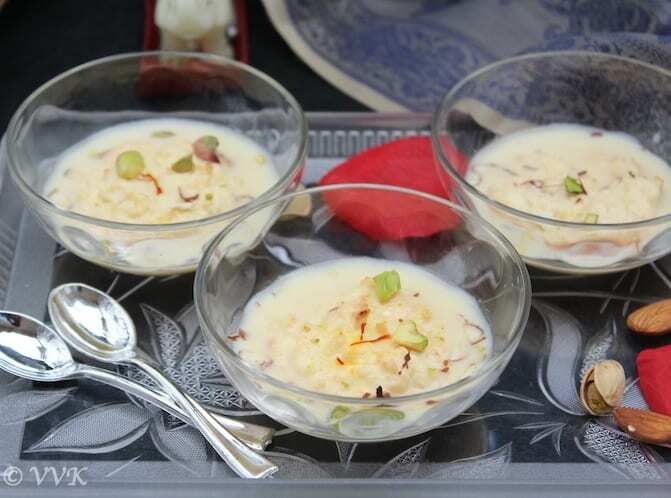 A Traditional recipe with a modern approach, instant semi homemade rasmalai where the malai is prepared with Ricotta cheese and the ras is prepared with evaporated milk and condensed milk. By the time the malai gets done, the ras will be cooled down also. In wide serve ware, place the baked ricotta cheese malai and slowly add the ras. Made this tonight, and it was truly delicious. Followed the recipe almost exactly, except for following tweaks: I added just a bit of ground cinnamon, nutmeg and allspice to the ricotta mixture, and stirred in a little rosewater into the ras (when it had cooled). I also only chilled the mixture for maybe 30-40 min because I was short on time, and that was just fine, in my opinion. 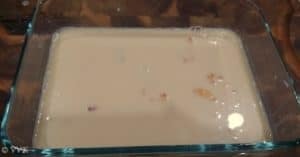 We order rasmalai at our favorite Indian restaurant often for dessert, but my fiance said he thought this version was even tastier and more flavorful. Thanks a lot Nina for trying and letting me know. Glad it worked out and you enjoyed it. 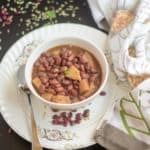 Love your tweaks, especially the rose water. Yummm. Will try those too. Once again thanks for sharing those tips. This is innovative Sri!I am trying this now. Will let you know how it turns out! Thanks Kushi. Did you try? How was it? I don’t know about Diwali traditions, but this looks delicious and sounds like an easy snack or dessert. I’d love to try it, maybe even with homemade ricotta. Thanks a lot and wow home made ricotta. That sounds interesting. 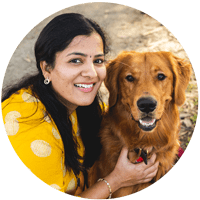 Will check in your blog..
Hi Vidhya!! 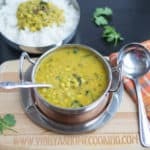 I would love to try this recipe for Diwali!! Do you recommend any specific brand of ricotta cheese?! Want to make sure I don’t mess it up!! Hi Roshni, I don’t have any recos as such. I used the partly skim ricotta cheese. Any brand like frigo, sergento should do. If you are not worried about the rennet stuff, galbani is fine too. Please do try and let me know how it turned out. Nice twist Vidhya… looks yummy?